Blaze Media Pro includes a powerful feature to convert MP3 to OGG, convert WAV to OGG, convert WMA to OGG, etc. with ease. To use the software's OGG converter feature, click "Convert Audio" from the main interface, and select "Convert to OGG". 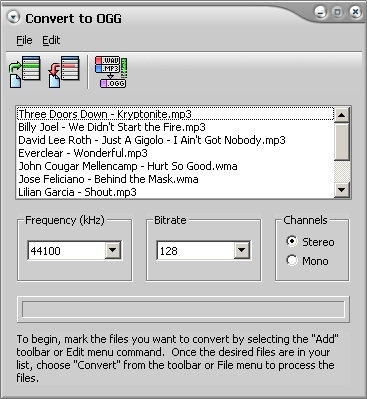 From the resulting OGG converter window, you can then add the audio files you wish to convert to OGG, set any desired OGG settings, such as bitrate, frequency, channels, etc. (optional), and click the convert button to begin conversion to OGG. The conversion process is performed in batch mode, which means that you can easily convert an entire list of audio files to OGG with very little effort. Supported source formats include WAV, WMA, OGG, MP2, VOX, MPC, and more. You can also change the compression for OGG files, such as converting from one OGG bitrate to another. Sample conversions include MP3 to OGG, WAV to OGG, WMA to OGG, etc. Conversion is very fast and easy to use. Advanced options are available for those who want to take advantage of them, though they are completely optional, making Blaze Media Pro the perfect OGG converter software for users of any experience level. The software also includes features to convert from OGG to MP3, WAV, WMA, and more. Click below for information on all the features Blaze Media Pro has to offer. software's OGG converter features or download your copy now.